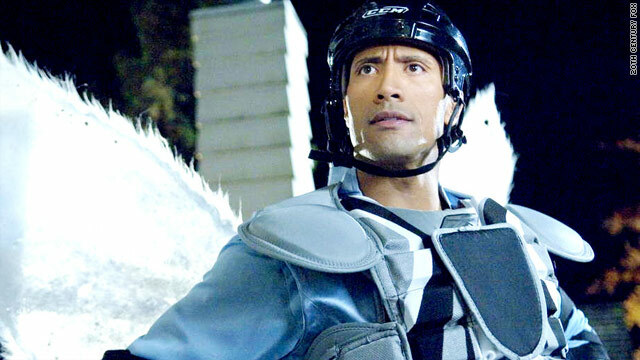 Dwayne "The Rock" Johnson has to earn his wings in "Tooth Fairy." (CNN) -- Whatever happened to the he-men? American movies in the 1980s and early '90s were so thick with testosterone that even the shotguns were pumped. Schwarzenegger, Stallone, Van Damme, Lundgren: Their biceps were thick, but their accents were thicker. We know what became of Arnold, and Sly will be marshalling many of his old sparring partners in "The Expendables" this summer. But with the exception of Jason Statham, yesterday's hard men have given way to today's boys: softies like Michael Cera, Jude Law and Shia LaBeouf. When Robert Downey Jr. is "Iron Man" and Edward Norton is "The Incredible Hulk," it's obvious there has been a sea-change in what the movies are telling us a real man looks like. Which brings us to Dwayne Johnson, aka The Rock, the ex-WWE star who transitioned to movies with "The Mummy Returns" and "The Scorpion King." Fifteen or 20 years ago, Johnson would probably have found his niche churning out violent exploitation thrillers for the video rental market. he has dabbled in that direction, with "Walking Tall" and "Doom," but he's really thrown himself into the kind of family comedy that Schwarzenegger pioneered when he wanted to soften up his image; the kind where the he-man is the punchline, until he learns to be a bit of a she-man. In "The Game Plan," Johnson was an egomaniacal NFL star who submitted to a beauty makeover and ballet lessons to placate the 8-year-old daughter he didn't know he had. In "Tooth Fairy," he's an egomaniacal hockey star, a bulldozer who earned his nickname by knocking out his opponents' teeth. He's a star attraction in a minor league team and bitter enough about his diminished prospects to pour cold water on anyone else's big time dreams -- and believe that he's doing them a favor. This is every bit as infantile as it sounds, with fairy dust on top. Apparently, the script has been kicking around since 1992, when Herr Schwarzenegger was a prospect, but it's hard to imagine that any of the five credited screenwriters spent any real time developing an idea that calls out for the trash bin. Among the supposedly comic indignities Johnson endures, almost all are squandered by director Michael Lembeck's clumsy execution. The Rock wearing a pink tutu feels like leftover business from "The Game Plan." Shrinking to the size of a string bean to sneak into a sleeping kid's room, that just feels kind of creepy. And throwing amnesiac dust around to cover his tracks -- that could have been funny, but you might wish you could get hold of some for yourself before the show is over. Collateral damage extends to Julie Andrews, inexplicably coaxed out of retirement to play a fairy overseer, and lanky British comedian Stephen Merchant (Ricky Gervais' partner in "The Office"), who towers over Johnson by a good three inches and predictably enough finds zero rapport with the 6-foot-4-inch muscleman. Billy Crystal injects some vaudeville shtick as a sort of fairy version of James Bond's Q, and the jokes are so old they're almost funny. For the rest, it's like pulling teeth. And Johnson? He grins and bears it but seems to have misplaced the genial charm that allowed us to overlook his shortcomings in the acting department. At one point, he even flushes himself down a toilet. He can expect his career to go the same way if he can't find better material than this. "Tooth Fairy" is rated PG and runs 102 minutes. For Entertainment Weekly's review, click here.